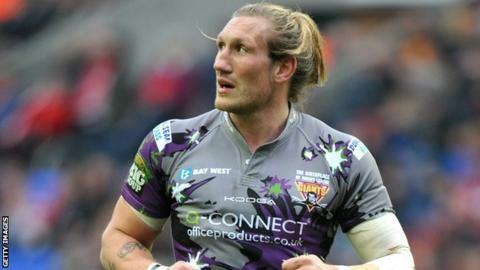 Huddersfield Giants' England forward Eorl Crabtree believes he will be fully fit for the new season after undergoing double surgery. Crabtree, 30, told the club website that operations on his shoulder and elbow had been "very successful". The 6ft 6in prop chose to forego probable selection for England's autumn internationals to try and deal with long-standing injury problems. He said: "At least I will be fresh going into the new season." Crabtree was one of the stand-out performers for the Giants in 2012, maintaining his form despite the club ending the season disappointingly. He commented: "Both operations have been very successful. I am enjoying the rest the surgery has given me, but at the same time I am trying to get my rehab done so I will be ready for the start of the new season. "Fortunately I am now in recovery and I am able to move around. I can't lift any weights, which is massively disappointing, but keeping fit is the biggest thing for me." Despite the success of the operation, Crabtree said his elbow would require further surgery at the end of next season. "I will be strapped up all year again so expect to see some bandages, but that won't stop me from putting my body on the line for the team," he continued. "I had the best year of my career so far last season even though I have had these injuries for a while now, so it will be good to move on. "England was a double-edge sword really because mentally and physically I felt like I really needed the rest and, at the same time, I really want to hang out with the England boys and put in some solid performances to cement my place in the World Cup next year. "Fortunately I have a year of Super League games to do that with the Giants."